Do you need a corkboard with easy and quick assembly? Self adhesive cork tiles are an ingenious and practical solution, enabling simple and quick assembly of the cork board in any place. To achieve this effect, we combined our cork notice boards with a special layer of strong and durable adhesive. Witch self adhesive cork boards, all you have to do is carefully peel back the protective film protecting the adhesive coating and press the stopper firmly against the selected substrate. You don't have to, therefore, look for a professional, worry about the selection of glue and wonder where you have drills and pegs. The used adhesive is very strong, thanks to which the cork board sheets are suitable for application on smooth as well as slightly rough surfaces. The condition for successful assembly is a completely dust-free, clean and dry substrate. That is why it is very important to carefully and accurately prepare the surface for assembly, that is, grounding or thorough cleaning. The cork pin board should be applied carefully, as the adhesive immediately binds with the substrate and it is no longer possible to adjust the position. The optimal substrates for the self adhesive cork tiles are plaster-coated or painted walls, concrete, brick, furniture board, glass or plastic. All other surfaces will also be suitable, provided that their surface is smooth and clean. 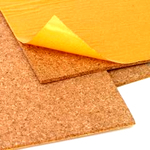 Sself adhesive cork boards are produced in a fine, medium and coarse version. The fine grained cork board wall will work in many types of production, the medium cork board will be an irreplaceable cork board, and the cork in the coarse grain will protect you against excessive cold and noise. If you are not sure yet which grain and thickness will be ideal for your needs, be sure to read the description of the category for each type of grain. The self adhesive cork tiles are not a standard product. We do it every time specially for you, when you receive your order, in accordance with the thickness, grain and quantity you choose. Cork products will be completely customized and tailored to your preferences. Therefore, think about your purchase before placing an order, because if you change your mind later, unfortunately we will not be able to accept a refund from you.